Uncap CD/DVD TREATMENT dispenser bottle. Remove optical buffer cloth from plastic bag. Pick up CD/DVD by edges, with shiny side up (label side down). Hold CD/DVD TREATMENT bottle about 8 inches from the CD/DVD. Lightly mist the shiny side of the CD/DVD for each treatment. Use optical buffer cloth to clean and polish the CD/DVD surface. 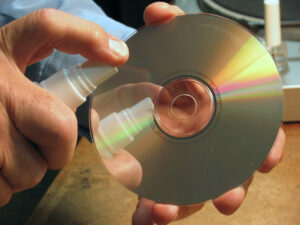 Buff in straight-line motions form the center to the outer edge of the CD/DVD until it is completely dry and polished. (Do not buff in circular motions). For repair of scuff abrasions and minor scratches, repeat steps 3 and 4. Treatment can be reapplied several times. Reapply CD/DVD TREATMENT whenever there is evidence of surface contamination, dust, fingerprints or poor playback quality. For additional surface protection try our DIGI-LAST™ PROTECTIVE SHIELDS. Keep CD/DVD Treatment out of the reach of children.